Genie Giaimo, Ph.D., is the current Director of The Ohio State University Writing Center. Before her arrival to OSU, she was Assistant Professor of English and Director of the Writing Centers at Bristol Community College. Her research applies RAD-based methodologies to large-scale and often systemic issues within writing center administration, such as perceptions of the writing center in open access institutions, or the impact of ordinary and extraordinary stress on writing center workers. She has published articles in peer reviewed journals such as Language and Literature, Literature and Medicine, European Journal of Life Writing and Praxis: A Writing Center Journal. She is also the special editor of the WLN issue on Wellness and Self-Care. In the time that she doesn’t manage a staff of 52+ graduate and undergraduate consultants, she practices yoga and volunteers at Colony Cats—a volunteer-run organization dedicated to trap and release, as well as the treatment and adoption of stray and surrendered cats, in Columbus, OH. WLN blog: Why is this an important issue? Giaimo: Writing Centers are not just spaces where writing occurs, or where education occurs; they are also spaces where emotionally charged exchanges happen and where burnout can occur among workers. WLN blog: Who are the writing centre people writing on wellness and self-care? Giaimo: Right now there are very few published pieces on this very broad topic. Degner, Wojciehowski, and Giroux’s piece “Opening Closed Doors: A Rationale For Creating a Safe Space for Tutors Struggling with Mental Health Concerns or Illness” (Praxis 2015) is perhaps one of the most cited; however, Mack and Hupp’s recent article (2017) on mindfulness in a community college writing center—also published in Praxis—is another that is unique in its own right. In the larger field of composition, Paula Mathieu studies writing activism and mindfulness and contemplative practice to bring about social justice. Research on the emotional aspects of tutoring and writing center labor have also been studied. There’s a great MA thesis by Christina Rowell on this topic, as well as Alison Perry’s “Training for Triggers: Helping Writing Center Consultants Navigate Emotional Sessions.” So, while it is an emergent field, in writing centers studies, there are certainly a lot of folks interested in the topic and conducting research on it. Also, the 2018 East Central Writing Center Association’s conference—hosted by The Ohio State University—focused on wellness, self-care and labor in writing center work. WLN blog: Do you see an increased need self-care and wellness in students? Giaimo: It’s hard to say, I think, anecdotally, that the recent Presidential election and the attendant uncertainty surrounding DACA, and other policies set in-place to protect vulnerable populations among us (such as persons of color, LGBTQ+, graduate students, among many many others) certainly has had an effect on the experiences and emotions of a number of students on campus. However, statistically speaking, Degner et al.’s piece noted the increase of mental health concerns, self-diagnosed or professionally diagnosed, among student populations entering college. So, yes, I think self-care and wellness is something that a number of universities are interested in fostering for their students and that student populations (as well as those outside universities) could benefit from being supported in this work. WLN blog: Why do you think that is? Giaimo: Well, as noted above, the hard-line rhetoric at the national and *some* state levels might be one reason. However, the increase of mental health concerns among student populations might be another. In short, there is no shortage of need for students, staff, faculty, and others who are doing all kinds of emotional labor, both in their jobs as well as in their academic and personal lives. WLN blog: Writing centres have often been seen as centres of social justice. Does wellness and self-care fit here? I connect activism and writing center work here because those who work in a writing center often feel a “calling” to support other writers that goes beyond the scope of what one might consider simply a “job.” These workers are committed to not only the pedagogical and intellectual support of their clients; they also often feel emotionally connected to the client’s ideas, writing, and feelings. They stay late, they come in early, they feel the highs and lows of the work profoundly. 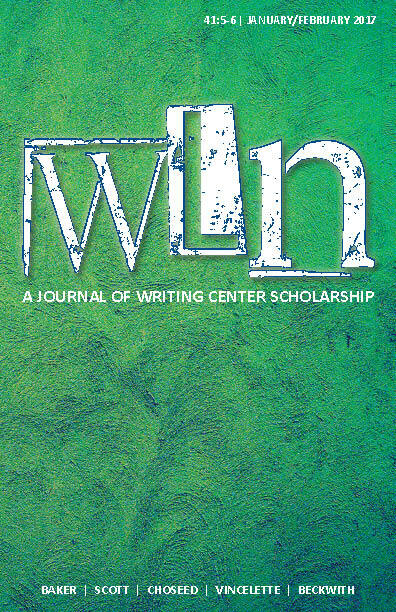 Therefore, writing center workers are performing, in my view, necessary work, helping their clients to reclaim their ideas, their writing style, their voices, and their confidence, which falls under social justice in my opinion, especially when compared with, or opposed to, a neo-conservative understanding of what a writing center should do, which is to “fix” students’ errors and standardize their academic writing and generally perform editing for remedial students. While we might offer many different kinds of support (including grammar and working with at-risk writers! ), a commitment to a social justice-oriented pedagogical style: one that aims to take the “whole student” into account—their identity, their culture, their socio-economic background—takes a lot of work and investment. Therefore, it’s important to identify how burnout might affect the often high-achieving student population who work in writing centers and to support them accordingly in this work. WLN Blog: What have you noticed in your own writing centre work from a wellness perspective? Giaimo: Typically, the staff seems to appreciate and want wellness and self-care support; however, they often struggle to find time to put what we discuss in our trainings into practice. And, while wellness and self-care are critical to their professional development and continued success as writing center employees, a lot of my staff struggle with negotiating their own needs, the needs of clients, and the policies and philosophies of the writing center at large. So, as an example, while we often take 15 minutes for a self-care/wellness break at the end of each session, consultants also record session notes. However, I have seen many consultants go over the scheduled 45 minutes because the client needed more support. So, one of the three legs (wellness/self-care, reportage, client need) of this end-of-session trifecta has to give. Often, the leg that gives out is the self-care portion. WLN Blog: What role do tutors play in the promoting wellness? Giaimo: Many consultants do research in this area, and some help to co-run trainings. Also, a group of graduate consultants presented on mindfulness exercises at ECWCA. In short, they work to promote this topic externally as well as within our organization. And, of course, many of them participate in these initiatives, though I need to note here that not everyone has come aboard in terms of wanting or engaging with wellness and self-care strategies. And, ultimately, that is fine with me. I think it’s important to provide these kinds of resources for staff members but think it’s against the spirit of the work to force people to participate. Staff are, however, obligated to attend certain kinds of wellness trainings, such as on emergency preparedness, as that is our policy for employment and non-negotiable. So, there’s give and take in these kinds of initiatives. WLN Blog: How should we begin to approach wellness in our own centres? Giaimo: Talk to your staff, talk to your colleagues, ask each other what you feel about your work and what kinds of support you do and maybe do not have enough of. Then, determine what kinds of wellness and self-care topics might be beneficial to closing those gaps or strengthening pre-existing successes. Wellness training takes all different kinds of forms and some can be relatively minimal and some much more investment-heavy. So, it’s important to consider what amount of wellness initiatives are wanted and/or needed in your particular center. Also, look around your institution to determine if anyone else is doing similar work. Initially, we partnered with our wellness center on-campus to discuss different training options and resources. We even did a joint training for part of our staff. Ultimately, we moved away from that training model in order to respond to unique needs in our center/organization, however, it was a great jumping-off point for our own training development. Also, I felt supported by the larger OSU community in undertaking this work because it is already aligned with University priorities. 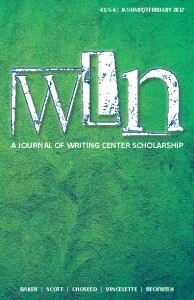 WLN Blog: Who should submit a piece to this special issue? Giaimo: Administrators who are doing research in the areas of wellness/self-care, as well as those who have training models that are based in particular kinds of research, such as organizational theory. Also, graduate, undergraduate and staff consultants who want to weigh-in on the topics of wellness and self-care, perhaps by providing narratives or initial research (or both) into these topics. In short, anyone who feels like they have scholarship to contribute (in 3,000 words, including references, or fewer) is welcome to propose a submission!